Admit it: A huge reason you follow this blog is because you want to see more of the girlie games. You’ll be glad to hear that I have acquired an impressive number of these in the last year. 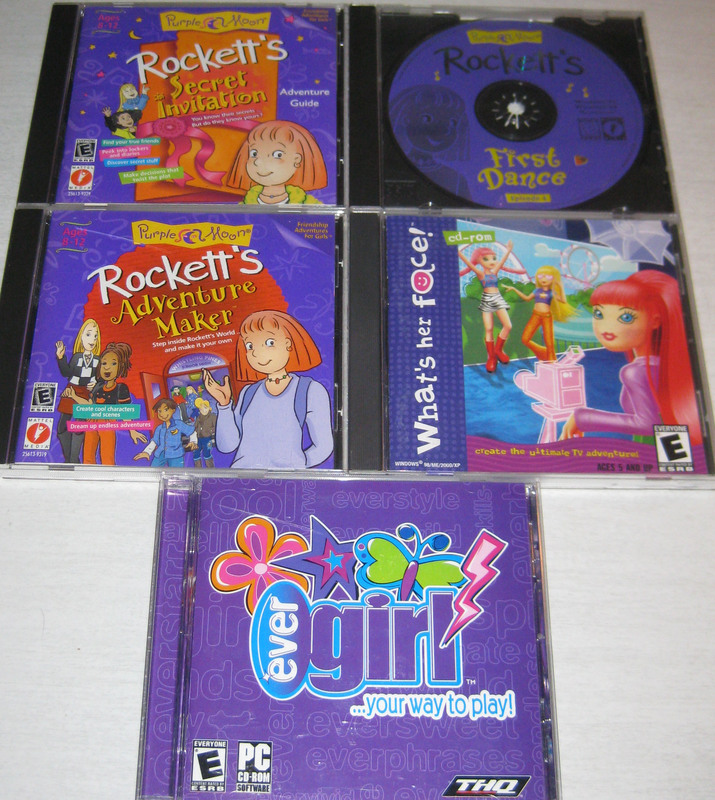 It should come as little surprised that almost none of these are in the MobyGames database yet. 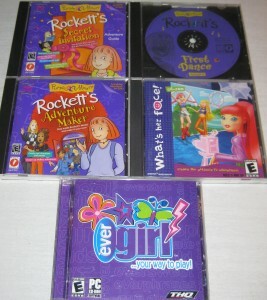 Evergirl …Your Way To Play! Yes! Barbie’s back! 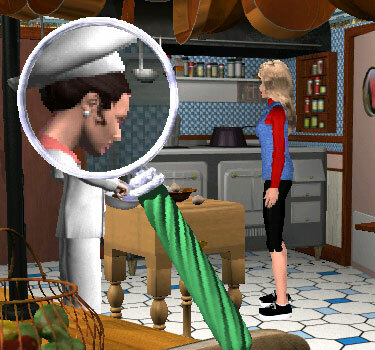 It seems that the initial outing for Team Barbie Detective in Barbie Detective (which I will probably eventually acquire so it can be entered into the database) was popular enough to warrant a sequel. So Barbie, Ken, and their wheelchair-bound friend — together comprising a formidable crime-solving force — take off on a much-needed vacation only to find themselves toe to toe with another tantalizing mystery at their resort destination. I’m not afraid, though, so I pressed forth. And I’m glad I did because this is the kind of game I live for in this Gaming Pathology project. Games that elicit just the right combination of awe, bewilderment, and outright guffaws. Really, I haven’t laughed so hard at a game while being simultaneously stunned since… I don’t know, maybe Secret Agent Barbie. Yeah, it’s a little weird when you first study the list. You can click on any of the selections and the game will cheerfully sound it out, though many of the adjacent selections sound the same. 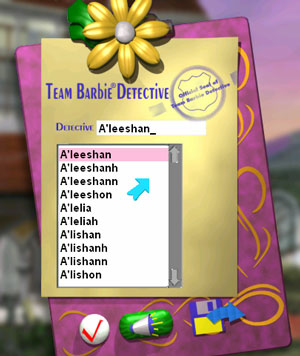 Throughout the game, Barbie will specifically address you by this name, although the pronunciation tends to sound a tad inconsistent with her normal speech patterns. When hovering the magnifying glass over the globe, a handprint glows green. I suspect I was supposed to care, but I couldn’t find a way to act on it. Detective Barbie 2 was developed by Gorilla Systems Corporation. They were also responsible for Barbie as Sleeping Beauty as well as Barbie Magic Genie Bottle (and presumably the custom accessory that came with it). 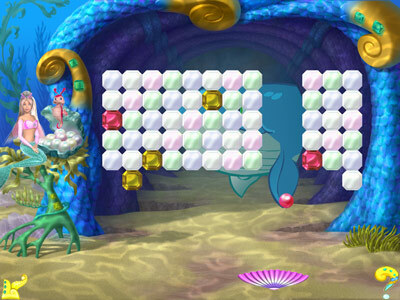 This game is based on a marginal 3D engine, perhaps similar to that found in Magic Genie Bottle. You guide Barbie left, right, forward, and back against a backdrop that scales in and out when going forward or back on the plane. It started to make me wonder if these were just straight bitmaps that were scaled in and out. However, Barbie can go behind and in front of objects. Further, she casts quasi-accurate shadows, so there might be some actual 3D work going on here. When using the magnifying glass over a region, all the pixels are just made bigger and blockier. 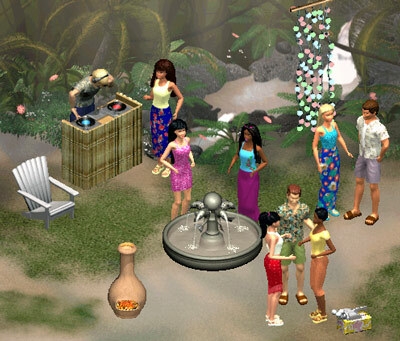 Along the way, the player talks to a colorful cast of characters, each of whom is naturally a suspect. Take the chef above, for example. Personally, I found her most suspect characteristic to be her accent, which seemed to shift between French, German, and Russian. I would like to include a sample here but I can’t figure out the coding format the speech samples are stored in. And what kind of car is that, anyway? At first, it looked a bit like a Porsche. But I don’t think I’ve ever seen such a spacious Porsche convertible. So, like I said, Barbie has to walk around the place and be spoon-fed clues and cues to advance the plot. Further, there are a few, more action-oriented activities, such as boat racing and hang gliding. I found the latter activity during my brief play. There wasn’t really any point (goal) to it that I could find; just a brief diversion. This is supposed to be a vacation after all. 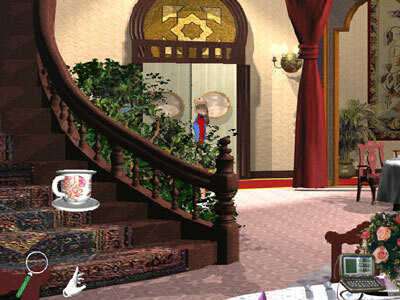 I must have tripped a plot point by visiting some other location because when I returned to this room, what do I find, but a phantom teacup just sort of floating there. This game isn’t supposed to have supernatural elements to it so I can only assume that this is merely an idiosyncrasy of the 3D engine. Anyway, I photograph it and feed the data into the portable crime computer. Kelly then notifies me via videoconference that it appears to be a teacup, most likely used for a garden party. She says this seriously as though it’s some kind of critical clue. This game is just ridiculous enough that I’m tempted to play it again some time to see what other kinds of amusement might await. I recently started maintaining a collaborative Google spreadsheet with several other MobyGames contributors in order to track games that are not yet listed in the MobyGames database. 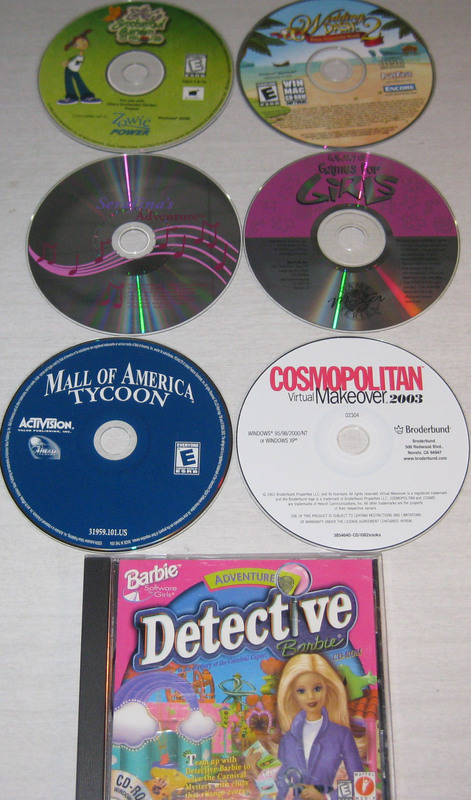 As part of the first pass, I made sure that all known Barbie games were either in the database or in the missing games spreadsheet by researching through Amazon.com. The things I’m willing to do for MobyGames. Yep, one more. Another Barbie title that I overlooked during my Barbie gaming spree back in January. Honestly, I don’t know why I even bother to keep a spreadsheet of all my games if it can’t even help me keep track. MobyGames needs to have complete information on every Barbie game under the sun, and my sources indicate that we aren’t even close to being done. 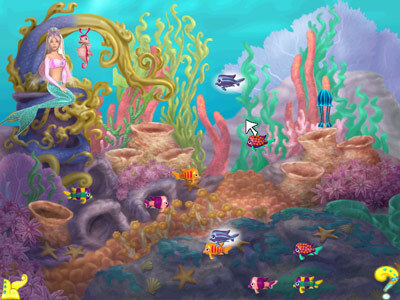 So Barbie dons her fins and takes to the water in Barbie Mermaid Adventure. There are minigames aplenty, starting with the cuddlefish game (not to be confused with cuttlefish, at least, that’s what I’m asserting). The goal is to rock them all to sleep. If you pass by one that’s already snoozing, it will wake up. So there’s a little logic at work here. The goal of the game is to prepare the big party. 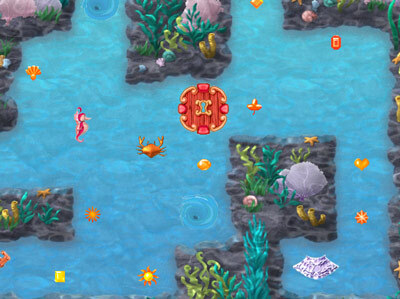 In each of the 3 levels, find the rainbow dolphin. 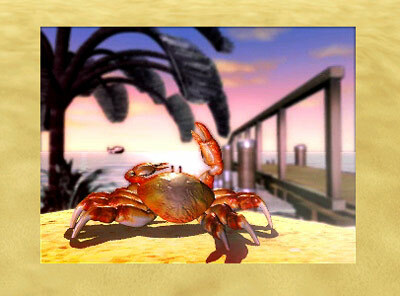 Before you can do that, you must complete the 2 minigames for the level. And while you’re at it, contact each of the 3 musicians jamming in that level. 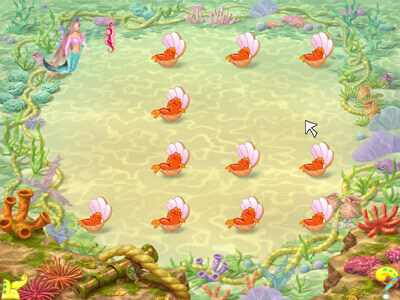 This game leaves me undecided about the aquatic doll — she’s either the most easygoing individual ever when faced with enormous stress, or she is a remarkable airhead who doesn’t understand priorities. The opening movie sets up all the problems (complete with all the juicy data I will need for a perfect MobyGames entry, which I managed to furiously transcribe, and I appreciate it was all explained right there in one place): We’re going to have a big party today with a carefully choreographed dance number to live music. But we need to personally invite the 9 musicians so that they can play — we’ll work out the music later. Oh, and the magic shell of light in the theater just broke. And that’s why we need the magical trio of rainbow dolphins — only they can repair it (I wanted to make a comment here about rainbow tuna nets but it’s late and I just can’t figure out a way to make it fit). And Barbie still has time to spare to cheerfully listen to a clownfish tell silly fish jokes. I wager there are times when Barbie wishes she wasn’t so good with animals. Barbie assured me the item was actually a necklace. Naturally, there is an activity where you can decorate the necklace as well as earrings and a crown using the seashells collected throughout the adventure. Another non-game activity is to jam with the musicians. You’ll be happy — or saddened, depending on whether you have the same twisted idea of entertainment that I do — to learn that tonight’s game will be the last Barbie game for awhile, until such time that I happen to procure another Barbie game that A) is not yet in MobyGames, or B) is already in the database, but that I genuinely want to play. What? 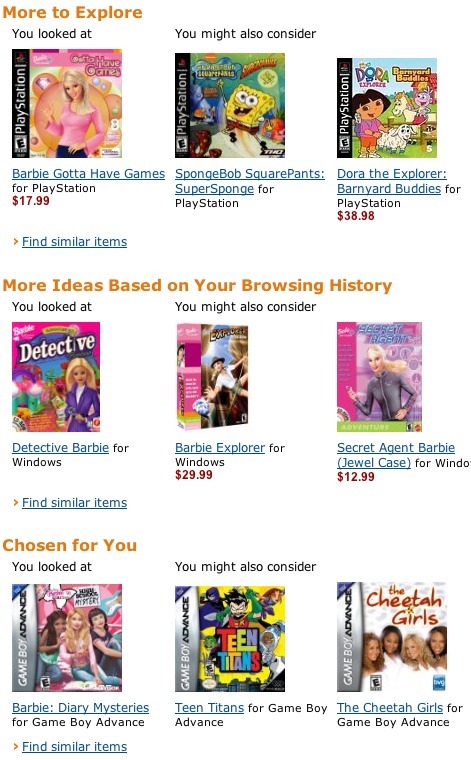 Yeah, you read that right — unless there’s a Barbie game that I actually care to try my hand at. 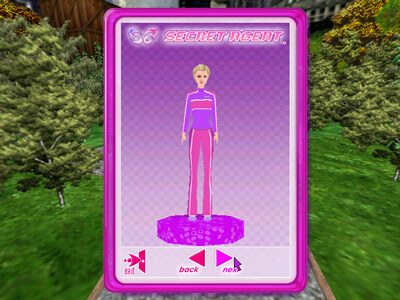 Tonight’s game — Secret Agent Barbie — already has a very complete record with a good description, diverse set of screenshots, and complete credits. But I admit that I want to see what this is about. After all, I’m a moderate fan of sneaking games like Metal Gear Solid. And after a week of metaphorically eating my vegetables by playing Barbie titles for MobyGames, I hope this tastes like dessert. As the name implies, Barbie does a stint at an espionage agency. The agency goes unnamed. And they don’t really fight international threats. Mostly, they seem to investigate theft incidents that occur in the world of high fashion. Really, the organization seems more like a private investigator’s office with an extravagant clothing budget. 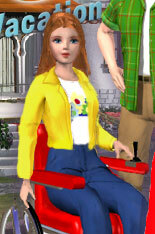 Clothing, you should know, plays a significant role in anything Barbie. This game is no different. 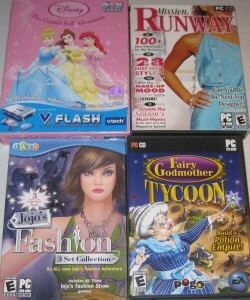 Barbie has to change clothes every time she switches into a different game mode. 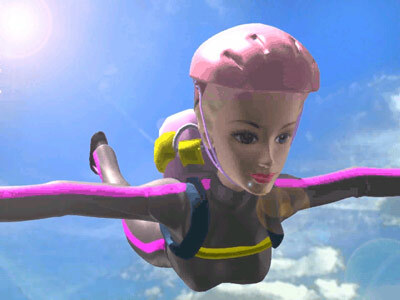 There are 3 such modes — action (where Barbie can run and jump, onto crates, for example), adventure (where Barbie can walk casually and talk to people), and stealth (where Barbie can crouch as she walks and can also do a roll). Clothing and guards– guards also play a significant role in the game. The game features extensive VR training for all 3 modes in which much of the focus is how to deal with guards. In stealth mode, the player is taught to perform a tumble-roll directly in the guard’s field of vision. Sure enough, he doesn’t notice you. In the adventure/talky mode, the player is instructed to use the makeup compact. After the guard gruffly warns that you are not allowed to pass, take out the compact and blow the contents in the guard’s face. Then casually wander past him. I guarantee that Barbie has never been more reprehensible than when she executes this maneuver. But I wanted to give this game the old college try. After the cursory, hand-holding training, the agency receives word that a famous fashion designer has had her designs stolen from the major New York fashion show, apparently held in Central Park. So Barbie ‘chutes in to investigate. The game immediately goes to action/jumping mode. In Central Park. Why? Crates, that’s why. Stacked meters high in central park. Amidst fields whose “keep off grass” signs must be backed with deadly force. Old Man Murray would be proud (see Crate Review System). So I wandered around the high fashion tent in Central Park and immediately found an invitation to a fashion show in Paris. This meant that Barbie had to go make a trip to that fashion mecca. Which is about the time that the banality thwarted any further interest. Obviously, all the missions are going to be extremely cut & dried– go to this location, avoid guard, find item; go to that location, use gadget, distract guard, find code; keep repeating. I mean, this is is so unlike Metal Gear Solid where Solid Snake is instructed to go to some location, avoid the guards, gather some item; then go to another location, use gadget… wait… ummm… well, at least Solid Snake doesn’t change his outfit all the time… no, wait, in parts 3 and 4, he is constantly changing camouflage as a key aspect of the game. Look, at least the Metal Gear Solid series has big, cool robots, a feature notably missing from this game… probably. I didn’t really play far enough. Frankly, if this game featured a final fashion contest against a giant fashion robot, I might have to qualify it as being even better than a Metal Gear Solid game.